Capoeira is an Afro- Brazilian martial art form with origins in the Bantu regions of Ancient Africa. It combines elements of dance, fight, natural movement, and theatrical improvisation with the rhythmic sounds of traditional call and response music. The Atabaque, Berimbau, Agogo, Pandeiro, and Reco Reco give birth to the instrumental battery that charges the Roda de Capoeira Angola. Arriving in the 16th Century in Brazil, Capoeira was developed as a tool for Africans to fight against the oppression of slavery, and hide their traditions and culture in order to preserve and perpetuate their Ancestral Rites. Capoeira was banned in the late 1800's for 30 years with participation in the defense resulting in torture, prison, and death. 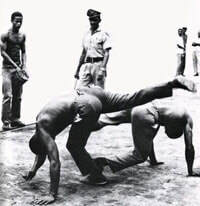 For almost 400 years Capoeira Angola was taught and practiced in secret... only in the 1930's did this African martial art become legal to teach and practice. 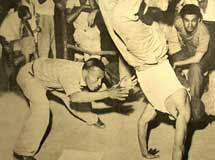 In 1941, Vicente Ferreira Pastinha founded Centro Esportivo de Capoeira Angola (CECA) in the Salvador neighborhood of Pelourinho. This school attracted many traditional Capoeiristas. 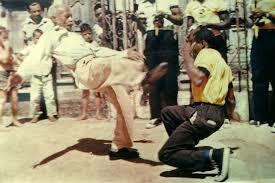 With CECA's prominence, the traditional style came to be called Capoeira Angola. On November 26th 2014, Capoeira was granted a special protected status as "intangible cultural heritage" by UNESCO. CRIANÇAS DE CAPOEIRA ANGOLA uses the Ancient Holistic Art of Capoeira Angola and its joyful play to expand the players reality of life. Training the use of positive action to overcome old and new obstacles are shared. Due to the exchange of wisdom, players are catapulted forward in understanding themselves and their surroundings- to act, not react and to make the best use of truth, patience, unwavering calmness, and humility to attract overall well-being in the Roda of life.